Remember when phones all had cords? Imagine what this man got done, without the aid of the internet, or twitter, or even answering machines, for that matter. Kind of humbles you. In honor of the great Dr Martin Luther King, Jr’s birthday lets remember what a truly inspired movement can do, how love and tolerance really can triumph over hatred and bullying, that the work of forming “a more perfect union” is never done, and that Cinderella isn’t the only person who gets to have her dreams come true. When I look at my daughter’s classroom full of mixed race kids, I know we have come a long way. But when my dad hears a pharmacist in the supposedly enlightened Hamptons refer to Michelle Obama in derogatory terms I am reminded of how far we still have to go. 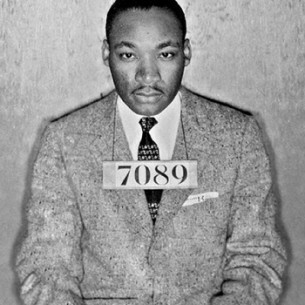 While jailed in Birmingham, AL, Dr King wrote an open letter to a group of white clergymen who had expressed disapproval of the non-violent actions he spearheaded. 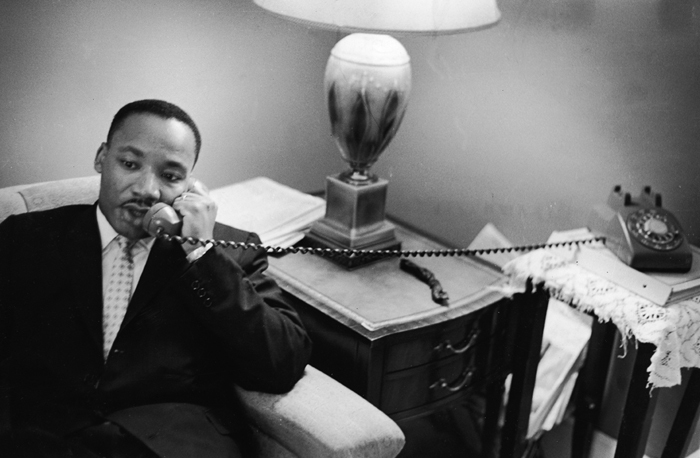 This letter remains one of the most important documents of the civil rights movement. If you’ve got a few minutes, I’ve included the entire text below. It is one of the most direct and beautifully argued letters ever written. While confined here in the Birmingham City Jail, I came across your recent statement calling my present activities “unwise and untimely.” Seldom do I pause to answer criticism of my work and ideas. If I sought to answer all the criticisms that cross my desk, my secretaries would have little time for anything other than such correspondence in the course of the day, and I would have no time for constructive work. But since I feel that you are men of genuine goodwill and that your criticisms are sincerely set forth, I want to try to answer your statements in what I hope will be patient and reasonable terms. I think I should indicate why I am here in Birmingham, since you have been influenced by the view which argues against ”outsiders coming in.” I have the honor of serving as president of the Southern Christian Leadership Conference, an organization operating in every Southern state, with headquarters in Atlanta, Georgia. We have some eighty-five affiliated organizations across the South, and one of them is the Alabama Christian Movement for Human Rights. Frequently we share staff, educational and financial resources with our affiliates. Several months ago the affiliate here in Birmingham asked us to be on call to engage in a nonviolent direct-action program if such were deemed necessary. We readily consented, and when the hour came we lived up to our promise. So I, along with several members of my staff, am here because I was invited here. I am here because I have organizational ties here. Then, last September, came the opportunity to talk with leaders of Birmingham’s economic community. 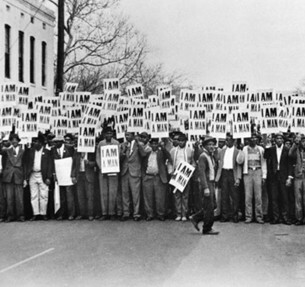 In the course of the negotiations, certain promises were made by the merchants–for example, to remove the stores’ humiliating racial signs.On the basis of these promises, the Reverend Fred Shuttlesworth and the leaders of the Alabama Christian Movement for Human Rights agreed to a moratorium on all demonstrations. As the weeks and months went by, we realized that we were the victims of a broken promise. A few signs, briefly removed, returned; the others remained. Then it occurred to us that Birmingham’s mayoralty election was coming up in March, and we speedily decided to postpone action until after election day. When we discovered that the Commissioner of Police Safety, Eugene “Bull” Connor, had piled up enough votes to be in the run-off, we decided again to postpone action until the day after the run-off so that the demonstrations could not be used to cloud the issues. Like many others, we waited to see Mr. Connor defeated, and to this end we endured postponement after postponement. Having aided in this community need, we felt that our direct-action program could be delayed no longer. But though I was initially disappointed at being categorized as an extremist, as I continued to think about the matter I gradually gained a measure of satisfaction from the label. Was not Jesus an extremist for love: “Love your enemies, bless them that curse you, do good to them that hate you, and pray for them which despitefully use you, and persecute you.” Was not Amos an extremist for justice: “Let justice roll down like waters and righteousness like an ever-flowing stream.” Was not Paul an extremist for the Christian gospel: “I bear in my body the marks of the Lord Jesus.” Was not Martin Luther an extremist: “Here I stand; I cannot do otherwise, so help me God.” And John Bunyan: “I will stay in jail to the end of my days before I make a butchery of my conscience.” And Abraham Lincoln: “This nation cannot survive half slave and half free.” And Thomas Jefferson: “We hold these truths to be self-evident, that all men are created equal …” So the question is not whether we will be extremists, but what kind of extremists we will be. Will we be extremists for hate or for love? Will we be extremists for the preservation of injustice or for the extension of justice? In that dramatic scene on Calvary’s hill three men were crucified. We must never forget that all three were crucified for the same crime–the crime of extremism. Two were extremists for immorality, and thus fell below their environment. The other, Jesus Christ, was an extremist for love, truth and goodness, and thereby rose above his environment. Perhaps the South, the nation and the world are in dire need of creative extremists.